Avery Marder, the Task Force Vice President has taken over in the interim, as the organization seeks to elect a new President. 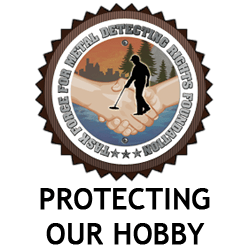 The Task Force board is made up entirely of volunteers, and it is through their efforts, along with the voice of our 1400 plus members that we have been meeting the challenges to our hobby which have been presenting themselves all across the country. Fighting for our rights is an ongoing battle, and the Task Force is always looking for volunteers. If you are interested in helping out, please contact me at allyson@detectingrights.com.